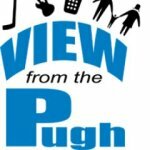 It was an eventful night Monday during the View From The Pugh podcast. We also talked about how some churches overdo it when inviting others to Easter services. It’s a lot like my dating habits in high school and college. We also talked about how sports needs more funny people in broadcasting. You can watch the video of Bill Walton here. And I yelled at John for his creepy obsession with Odell Beckhem Jr. on Twitter. It was awkward and fun at the same time.